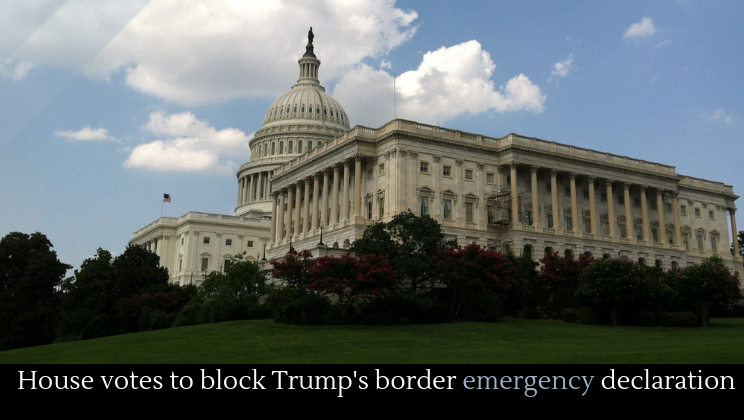 Earlier this month, President Trump declared a national emergency, enabling him to fund his border wall without congressional approval. His end-run around the legislative branch ensured that Trump could avoid being blamed for another government shutdown but still appease his base by building the wall. Although it may have seemed to him either, 1) a savvy political move (lol), 2) a middle finger to the Democrats (more likely), in reality the move represented such a dramatic instance of executive overreach that, for many, it threatened a constitutional crisis. That crisis is now one step closer to be averted. The House of Representatives voted to block Trump’s emergency border declaration. Speaking to House Republicans, “Is your oath of office to Donald Trump or is it to the Constitution of the United States?” Thirteen Republicans joined the Democrats in blocking the declaration. The Senate will now vote on the law to block Trump’s border declaration and, as CNN points out, Senate Republicans have a “math problem.” Two senators have so far promised to vote in favor of blocking the wall, and the political tide is turning against it at a quickening pace. If just one more Republican votes to overturn, the jig is up.